How can you save money on chicken feed? Here are a few time-tested methods. Can My Chickens Find All Their Feed Themselves? Not really. In the old days, farms and kitchens were so wasteful, with so much grain spilled by the horses and milk cows, and so much garbage thrown out the back door (or, in town, the front door), that flocks of skinny chickens could survive without further attention. With an increase in our understanding of sanitation and nutrition, opportunities for self-feeding flocks are few and far between. Start with a balanced chicken feed. Then supplement with other, lower-cost feedstuffs to keep the costs down. Here’s an old trick that not everyone knows about: If you feed your chickens out of two feeders, one full of grain and the o ther one full of chicken feed, you save money. Why? Because chickens have a reasonably accurate appetite for calories, protein, and other things, and will mix and match the two feeds in a way that’s ideal for their needs of the moment. For example, a hen laying an egg a day needs a lot more protein than a hen that isn’t laying at all. The non-laying hen will not only eat less total food, but most of what little she eats will come out of the feeder of cheap grain, not the expensive balanced chicken feed. And it works not only with grain, but with other inexpensive feeds, including some you can get for free. Feed intrudes into every aspect of life. 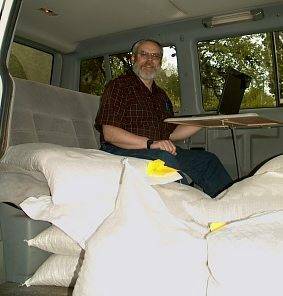 Here’s me sharing my VW van with half a ton of feed. This has been a standard feeding technique for 100 years, and has been studied six ways from Sunday. Laying hens given access to a balanced 16% layer ration in one feeder and corn or wheat in another feeder will eat about 2/3 layer ration and 1/3 grain, and will do exactly as well as hens that eat nothing but the balanced ration. If you use a 20% layer ration, the hens will eat 1/2 grain and 1/2 layer ration. For example, I just looked up the price of Purina 16% Layena pellets at Tractor Supply: $13.00 for 50 lbs. A 20% feed, Purina Flock Raiser, is $17.99. Cracked corn from the same source is only $9.89. Grain alone: Don’t try it. So you can save some money just by buying a different mix of feed at the feed store. It does! This has always rather annoyed poultry nutritionists, because their job is to find the right feed for the whole flock, as if all its hens were the same. And of course they aren’t. The key seems to be that only the high-producing hens need the full 16% protein, while the ones who aren’t laying much anyway don’t need all that protein—and don’t crave it. This feed plus grain method best if the chickens are given clear choices: a high-protein feed and a high-energy feed. The grain is the high-energy feed. Traditionally, there are two kinds of layer ration: a 16% ration and a 20% ration. With the 20% ration, the hens will eat about half grain, half 20% ration. Such rations are formulated for use with supplemental grain, so they contain extra calcium and such. For broilers, you simply use the same broiler ration as ever, but with supplemental grain in a second feeder. If you used to use a finisher ration, try using the starter or grower ration plus grain. The results will probably be the same as ever, but the cost will be less. Corn and wheat are the grains of choice here. They can be tolerated by chickens of any age. Use whichever is cheapest. Baby chicks can’t handle oats or barley very well. Even quite young chicks (a week old or so) can handle whole wheat. They can handle whole corn once they’re about half-grown. For baby chicks, go for whole wheat or cracked corn. For older chickens, go for whole corn, whole wheat, whole oats, or whole barley. As soon as you crack or grind grain, it starts to spoil. Whole grains are best for this reason. You can keep whole grain for a year or more without trouble, while you should use up other chicken feed within a month or so. This means that, if you have a place to store it, you can buy whole grain by the pickup load, the tote, or the ton even when you’re buying other feed a few couple of sacks at a time. Always feed in separate feeders: chicken feed in one feeder, grain in another, oystershell in a third. Why? Because every time you mix two things together, the chickens waste the one they want least, tossing it aside to get at the one they want more. By mixing feed, you’re wasting both your time and the feed. The main reason to mix feed is to slip in ingredients that chickens don’t like, forcing them to eat stuff that’s unpalatable or even harmful. Don’t do that. Bakery byproducts: expired bread, waste flour, etc. Potatoes (whole potatoes need to be at least slightly cooked to make the skins edible). Expired high-carb foods of all kinds: pasta, cereal, pastries, chips—you name it. Grain-based feed originally intended for other critters: oats, cob, birdseed. Other (non-medicated) feeds: cat food, dog food, pig feed, etc. Meat, dairy, fish (fresh or processed). Imitation meat and dairy like milk replacer and tofu. If the chickens have access to a feeder full of chicken feed, they’re really good at avoiding other feeds that are bad for them. They will balance their own diets by eating a little of this and a little of that better than any but the best poultry nutritionists can. Don’t get invested. Offer it to the chickens, and if they spurn it, take it away again. Don’t feed so much that it’s likely to go bad, or even stale. Feed troughs are your friend here, since they can handle a wider variety of materials than other feeders. Feed pans are less good because the chickens will stand in them. Feeds that will rot before they can be eaten. Think twice before accepting a hundred pounds of fish on behalf of your chickens! Feeds that will put an off-flavor in the eggs: Garlic and onions (in large quantities) have this reputation. Feeds that are messy in some ghastly way. For example, if you set out a pan of pancake syrup and end up with sticky chickens, I’m not sure what your next move is! Rotten or contaminated feed. Yes, chickens have “nutritional wisdom,” but don’t try to fool them with horrible awful stuff. You might succeed! How About Three Feeders? Or Four? A three-feeder system is even better, with oystershell in the third feeder. Hens have a definite calcium appetite. If they have to eat chicken feed for its oystershell content, even if they don’t want the calories, well, a hen’s gotta do what a hen’s gotta do. But they’ll go straight for the oystershell if they can, which means they’ll eat less chicken feed, and save you money. According to Leeson and Summers’ Commercial Poultry Nutrition, feeding oystershell on the side can give total feed savings of 6%-7%. To get the maximum feed savings, you need to find your local provider of low-priced grain. Usually there’s a local vendor who is selling it at a much lower price than the feed store. Here in the Corvallis area, we have Venell Feed and Corvallis Feed and Seed. At one time, they were selling whole corn at $6.00 a sack, while at Kropf Feed (now CHS Nutrition) it was $10.20 a sack. This is typical. So you could save save over 40% on grain simply by going to a different store. And that’s the price for individual sacks. There are more discounts where that came from, if you buy a ton of bagged feed at a time. Can’t I Just Feed My Chickens Less? You can’t starve profit into a cow. It applies to chickens as well. The fact is, you have no idea how much your chickens “should” be eating. You’re guessing. But your chickens have an accurate appetite. They know when they’re hungry and know when they’re full. You don’t. Leave it to them. My free-range laying flock has 24/7 access to chicken feed and grain, plus all the pasture forage they want. Do they get fat? No, not at all. In the 120 years since poultry scientists have kept track of such things, they’ve never had luck at increasing egg profitability by withholding feed from the hens. The winning strategy is always to give them all the feed they want. If you can’t afford your feed bill, reduce the size of your flock. It’s different with broilers. If you keep them past butchering age, they’ll get really fat. But the solution here is “don’t do that.” It’s not a feed issue. The best thing about the two-feeder system is that you don’t have to be a poultry nutritionist. As long as you have that feeder of balanced chicken feed, your chickens will do fine. But there’s plenty more to learn, and plenty more you can do once you’ve learned it. That’s why I’ve republished G. F. Heuser’s monumental Feeding Poultry under my Norton Creek Press label. It has everything. It even has a chapter on the nutritional value of green feed and free range. 1. Poultry have some ability to balance their diets when allowed an appropriate choice of feeds. 2. The nutritional requirements of organic poultry have not been well defined. 3. The program is likely to be more profitable, as pointed out in this report. 4. Whole grain helps to promote optimal gut development, especially of the gizzard, which may assist in disease resistance. 4. Choice-feeding is closer to the natural way of eating for poultry. If layers do well consistently when given the choice of grain or a 16% protein layer feed and consume about 30% grain and 70% layer feed, it follows that the 16% layer feed contains more nutrients than are needed by the birds in that particular flock. The possible drawback of this program is that the birds when in high production and possibly continuing to consume substantial quantities of grain may develop a nutritional deficiency. In my book Nutrition and Feeding of Organic Poultry I have suggested a choice-feeding program based on grain and a Supplement (concentrate instead of a layer diet) as the 2 feeds. A Supplement provides all of the nutrients not provided by the grain and is therefore a safer choice than the layer diet. However producers may find it more difficult to purchase organic Supplement than an organic layer diet. In either case producers should provide 3 feeders for the birds, the first containing grain, the second containing layer diet (or Supplement) and the third oystershell grit (for eggshell production). The grain could be oats, wheat or barley etc. (or a mixture) and fed whole. Corn needs to be kibbled for feeding to poultry since the whole kernels are too large for the birds to ingest easily. Hi Robert, have you tried feeding okara to layers? Thanks. Not me. Okara has never been on my radar. I think it’s a byproduct of soy milk production, and I’m over a thousand miles away from soybean country. Agriculture in my neck of the woods is dominated by the grass-seed industry, and its byproducts aren’t very palatable to chickens. So along the lines of independent, sustainable farming, have you tried rotating your chickens with wheat or grain crops? Surely the rich soil would provide excellent feed for the chickens, as well as straw for litter. Even at today’s prices, it’s a lot cheaper for me to sell my eggs at niche-market prices and buy my grain and straw at commodity prices than it is to grow my own. In the meantime, the pasture absorbs all the nutrients and is presumably making the topsoil deeper as well as richer. The fertility will be there when I want it. A farmer we know used to grow grain on about ten acres, and fed it to cattle and chickens. But he was an old, experienced farmer who was wise in the ways of cranky old combines. I’m not sure grain on small acreage makes sense unless you already have that kind of experience. I’m planning on trying kale, sunflowers, and corn next year, though, as much for their shade as their nutritional value for the chickens. We’ll see what happens. I am interested in getting the soy out of our feed for our chickens. They are pastured and the organic corn and wheat we feed is of excellent quality, (we grow it ourselves and our fields are regularly tested). I also have access to barley but it is not hulled, can I feed that to the girls. We have 200 hens right now and I hope to grow when I can get through these soy issues. Any help would be greatly appreciated. I’m personally not impressed by the recent backlash against soy, just as I wasn’t impressed by the pro-soy love-fest that preceded it. It’s just a bean, when all is said and done. It’s not hard to eliminate soy from poultry diets, just expensive. Chickens need some kind of balanced protein supplement in their feed, and soy (plus some other stuff, since its protein isn’t balanced) is by far the cheapest. Has been for over fifty years. Replacing the soy with meat is very easy from a nutritional point of view, since meat has complete protein and vitamin B12 and a lot of minerals that soy lacks. Trying to raise chickens on grain alone is a recipe for failure — you’ll be lucky if all you suffer is low production, and not deficiency diseases. I have your book Success with baby chicks and just love it. It was very helpful through my whole process. We even built the brooder light that you had the diagrams for. It works great. My hens are now laying and I’m enjoying it very much, since this is a first for my husband and I. My question is about feed. We were raising some meat birds for a friend of ours for the first 5 wks of their life. Now he has them on his property and is feeding them cattle feed because its cheaper and he has cattle also. My husband and I don’t agree with this. Is this bad for the birds or are we worrying for nothing? I would appreciate the feed back. It depends on the cattle feed, but cattle and chickens have very different digestive systems, so fiber that is digestible by cattle does nothing for chickens, while chickens want higher levels of proteins. They’re omnivores by nature, unlike cattle. Now if they were feeding pig food or dog food or Purina Human Chow, that would work better. It would still be more expensive and less nutritious than feeding a high-quality chicken feed, but it would likely be in the right ballpark if you’re not too particular.